Published in Grass Roots Magazine 2014. The gardeners best friend is surely the chicken. 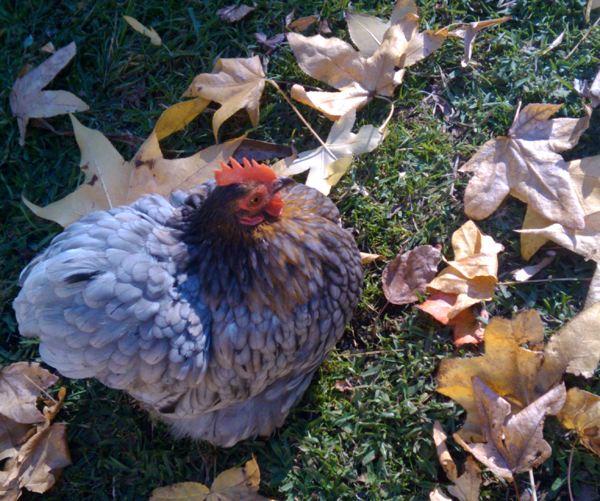 They dig up weeds and process food scraps into beautiful manure and fresh eggs. Not to mention the entertainment of watching their antics. These attributes make chickens great workers in the vegetable patch by reducing human labour. All they ask for in return is a handful of grain and a warm dry perch to roost on. 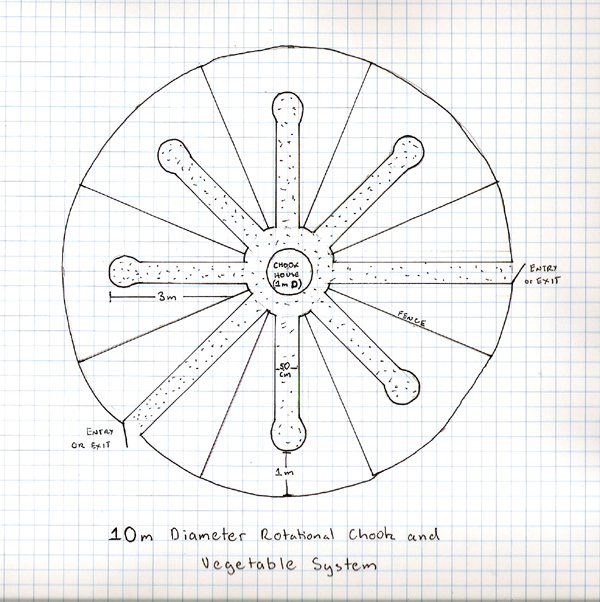 With a little planning chooks can be integrated into a rotational vegetable bed system with great success. For our new garden we have chosen a variation on a mandala circle garden by combining it with a chook clock system. A mandala garden is an aesthetically pleasing design comprised of a circular garden, generally with one entry point, and a series of keyhole paths radiating out from the centre. This design maximises the growing space by minimising paths, whilst keeping everything within reach for easy harvesting. A typical mandala arranges each bed as a circle with the key hole path at the centre. A clock chook system places a chicken house in the centre of two or more fenced chicken yards that can be used as rotational vegetable beds. In our garden we have chosen to overlay the clock concept onto a mandala garden. The chicken house is placed in the centre where the paths converge, the beds are shaped into pie slices and fenced, with a keyhole path providing access to the centre of each bed. The system will operate on a rotation of chickens for 1 - 3 weeks, followed by vegetables for one to two crops, followed by chickens and so forth. Each bed will be sown with a mixture of seasonal vegetables of a quantity that will supply our household for 3 - 4 weeks, with a new bed sown every 3 - 4 weeks. This differs to the classic method of planting one plant family per bed, resembling more of a parterre garden that will provide successive harvests. The chickens will not be required full time in the vegetable garden, so will have access to our orchard, food forest or horse paddock at other times. This system utilises chickens to reduce human labour, improve the soil and keeps them healthy by the process of regularly moving them to new ground to avoid a worm build up in the soil. The fixed chook house has advantages over other systems that use chicken tractors or domes. The house can be raised over a meter above ground level to prevent access by dogs or foxes, and can be well insulated against temperature extremes and noisy roosters. I selected this post to be featured on Culture Blogs. Please visit the site and vote for my blog!